Hoesley students and WIC staff gather at a networking dinner. 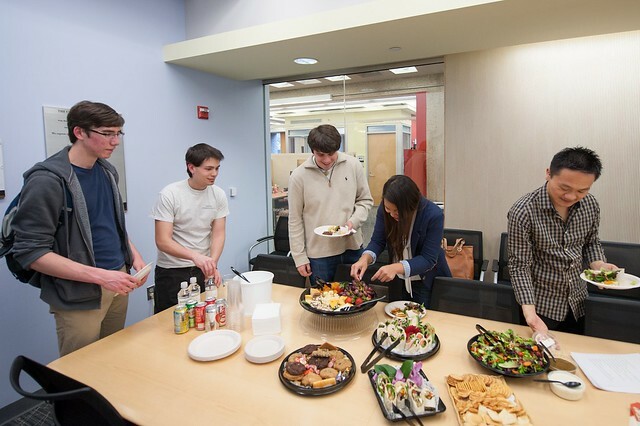 We learned about each other’s career aspirations at the Hoesley Networking Mixer on December 5. Students in this year’s cohort presented drafts of their professional websites, and gathered suggestions from administrators from around campus, including the WIC Program Partners Group. We reflected on the challenge of self-introductions in different contexts – What do you include? What do you emphasize? What do you skip over? How do you present yourself and judge the context you find yourself in? All these questions are important regardless of one’s age or years of experience. Students had used WordPress and Squarespace for their sites, and experimented with photos, videos, 3D molecule models and musical interpretations. Seeing each other’s work on the big screen was inspirational! We look forward to our students publishing their websites in the months ahead. Congrats Hoesley 2011, Welcome 2012 Cohort! 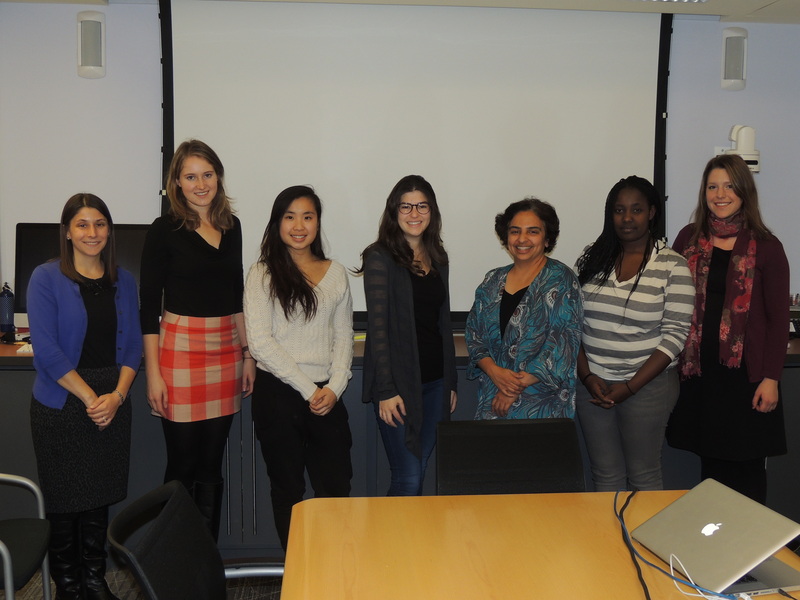 All of us at WIC extend our congratulations to the 2011 Hoesley fellows for successful completion of this year-long program! We enjoyed lis tening to the opening invocation presented by Marwa Ibrahim from Hoesley 2011 cohort at the 25 annual Women of Color at Penn Day (WOCAP) Conference and Awards Luncheon. This event, organized by the African American Resource Center on campus, brought together a wonderful, large gathering from all over the Penn campus, including a sizable group from Penn Libraries. Shaina Adams-El Guabli (from Penn Women's Center), Marwa Ibrahim and Anu Vedantham at the WOC Luncheon. Photo by Rebecca Hamell Presley. Marwa lighted a candle and kicked off the lunch program with a short inspirational speech. She spoke beautifully about the need to look for what we have in common, rather than focusing on what divides us. Before beginning the Hoesley program I was most excited to learn about graphic design and creating my own website. What I realized from our sessions about both of those though is just how big, complex and time-consuming they both can be. I couldn’t believe all the work that went into the designs that the WIC staff had created when they explained them to us, and it was frankly a little daunting. But it was really the principles and ideas of design that they discussed that I think stuck with me most–it was almost like a secret code that made me look at designs on things like posters and books a little differently. As for the website, what I really took away from making one was how much of a process it was. Before, I had assumed that you simply create a website, maybe with a lot of work, but when you’ve done what you wanted to do then you’re simply finished. My own experience with my WordPress site has been the exact opposite. I change something and finally feel good about it, and then realize that that’s not in fact how I want it. And part of that process I realized involved quests for seeking help, which in itself could be a lengthy process. But now that I’ve learned this, I’ve accepted the fact that I’ll probably never be fully satisfied with what I have, and part of the fun–and educational–part of it is the process of editing it. My name is Ross Kelley, and I was part of the 2011-2012 cohort of the Hoesley Digital Literacy Fellows program. I was excited to join the program so I could learn about the many valuable software tools I never thought I would have the skills to use. Even though I had Excel experience prior to the program, what I learned about Photoshop, Prezi, Google programs, website creation, and even tools for my job search and career more than exceeded my expectations. This program provided ample time for interaction with these tools through its helpful hands-on learning environment and access to training videos on Lynda.com. As a result of the Hoesley program, I am far more proficient with these tools and confident in my ability to learn how to use others. Creating my own website was definitely the most exciting part of this program. I was thrilled to hone this very valuable skill and leave my mark on the Internet. I am particularly proud of my new abilities to embed a Prezi and other graphics, customize the site’s theme, and transition to a self-hosted site, which I will explore further after graduation. My name is Windy; I am a junior in the college majoring in Communications. I had no idea what I wanted to do post-graduation when I applied for the Hoesley Digital Literacy Program last year. I just knew that whatever career path I choose, skills and knowledge with web design, and various computer software and programs are vital and that I lack some basic computer skills. We met once a week for an hour during the fall semester. Each session is split in half; we receive a tutorial in the first half, and apply what we just learned in the second half. The class structure is very flexible and tailored to the students’ need and interest. We had a special WordPress session because many of use chose it as our website’s host and encountered some problems. The staff at WIC and Vitale Digital Media Lab has been immensely helpful and are critical to the development of our website. I designed my website through WordPress, but unfortunately, it is still under construction and is not ready for publication yet. One of the hardest parts in the process was starting the website, that is, choosing the platform (Google Site, Tumblr, or WordPress) and a theme. I tried with all of them, but I ultimately chose WordPress because it seemed more intuitive (they are all good ones to use with a lot of resources and help available, I would experiment with the other ones in the future). The next hard thing was to choose a theme. WordPress has many themes available to suit each kind of personality and web theme. I changed it multiple times in search of something that has personality but is professional at the same time. Then, I have to decide what information I want to have available to my website’s visitors. I have the menus in place, but I am still collecting content to fill the pages up. I learned that a blog is not a good addition unless one has time to update it on a regular basis, so I changed my home page to a static “About Me” page. The process has been fun and worthwhile. I gained many skills from the Hoesley Digital Literacy Program that I can apply immediately in my activities and assignments. Even if you cannot commit to the Hoesley Program, I encourage you to attend WICShops and the Vitale Digital Media Lab when you run into problems. “If you think something is too complicated and you are going through too many steps, there is an easier solution” and Weigle has the answers.